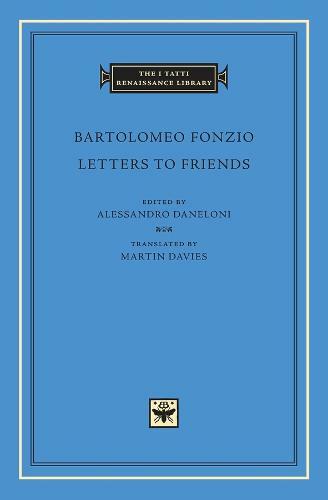 Bartolomeo Fonzio (1447--1513) was a leading literary figure in Florence during the time of Lorenzo de' Medici and Machiavelli. A professor of poetry and rhetoric at the University of Florence, he included among his friends and colleagues leading figures such as Marsilio Ficino, Angelo Poliziano, John Argyropoulos, Cristoforo Landino, and Pietro Soderini. He was one of the principal collaborators in creating the famous humanist library of King Mattyas Corvinus of Hungary. As a scholar and teacher, he devoted himself to the study of classical authors, particularly Valerius Flaccus, Livy, Persius and Juvenal; his studies of Juvenal led to bitter polemics with Poliziano. Fonzio's letters, translated here for the first time into English, are a window into the world of Renaissance humanism and classical scholarship, and include the famous letter about the discovery in 1485 on the Via Appia of the perfectly preserved body of a Roman girl.